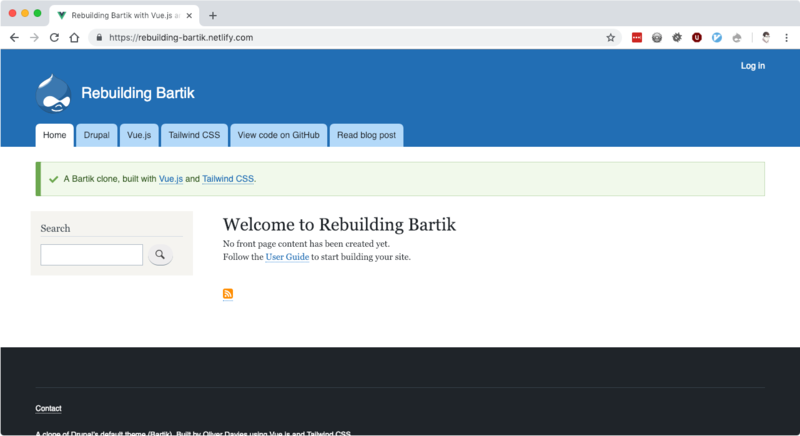 In the original post I detailed how I built a clone of Drupal’s Bartik theme with Vue.js and Tailwind CSS. This follow-up post details some updates that I’ve made to it since then. During the first version of the page, my thoughts were to not edit the Tailwind configuration, however I changed my mind on this whilst working on the subsequent updates and did make some changes and customisations to the tailwind.js file. By default, Tailwind includes a full colour palette including colours such as yellows, oranges, reds that weren’t being used in this page so they were removed. This makes the file more readable as well as reduces the number of classes that Tailwind generates. Whist I was changing the colours, I also took the opportunity to tweak the values of the remaining colours to more closely match Bartik’s original colours. I also added a black-60 class which uses RGBA to provide a semi-transparent background. I used this when adding the skip to main content link. In the first version, every link was individually styled which resulted in a lot of duplicate classes and a potential maintenance issue. I added a style section within Welcome.vue, and added some default styling for links based on their location on the page - extracting some Tailwind components. Within the style section, I’m able to use Tailwind’s custom @apply directive to inject it’s rules into more traditional CSS, rather than needing to add them onto every link. As well as being able to extract re-usable components within Tailwind, the same can be done within Vue. 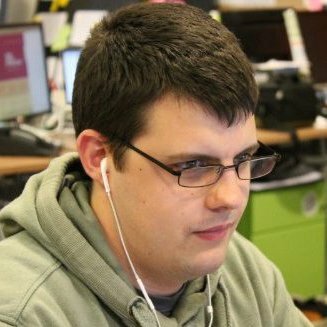 As the page could potentially have multiple sidebar blocks, I extracted a SidebarBlock component which would act as a wrapper around the block’s contents. The component provides the wrapping div and the appropriate classes in a single easy-to-maintain location, and uses a slot as a placeholder for the main content. That means that within Welcome.vue, the markup within the sidebar-block tags will be used as the block contents. One thing that was missing was the 'Skip to main content link'. This an accessibility feature that allows for users who are navigating the page using only a keyboard to bypass the navigation links and skip straight to the main content if they wish by clicking a link that is hidden and only visible whilst it’s focussed on. Here is the markup that I used, which is placed directly after the opening <body> tag. I initially tried to implement the same feature on this website using Tailwind’s visually hidden plugin which also contains a focussable class, though I wasn’t able to style it the way that I needed. I created my own Tailwind skip link plugin and moved the re-usable styling there. I added only the page-specific styling classes to the link (as well as the skip-link class that the plugin requires) as well as my own focus state to the skip link that I did within the style section of App.vue. I also added a version of Drupal’s status message as another Vue component. This also uses a slot to include the message contents and accepts a prop for the message type. The value of the type prop is then used within some computed properties to determine the type specific classes to add (e.g. green for success, and red for warning), as well as whether or not to include the checkmark SVG image. I did need to make one change to the tailwind.js file in order to change the border on links when they are hovered over - within modules I needed to enable the borderStyle module for hover and focus states in order for Tailwind to generate the additional classes. The message is included within the Welcome component by including the <drupal-message /> element, though rather than importing it there, it’s registed as a global component so it would be available to any other components that could be added in the future. 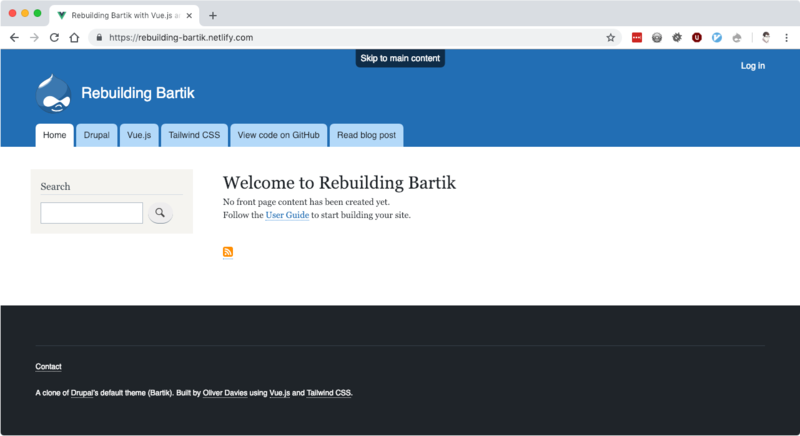 The updated version is live on Netlify, and the latest source code is available on GitHub.